No matter where you live, it’s smart to keep up with all vehicle maintenance. This is not only good planning, but it might help prevent you from being injured in a serious accident. When you ignore a small maintenance issue, it can develop into a bigger and more expensive problem. The problem might blow up in your face if your brakes totally give out while you’re driving your car on a busy interstate. You might end up kicking yourself for a brakes problem if you let the issue go too long and then find yourself on the side of a busy Florida road. This situation can go from bad to worse if you caused an accident and someone else has been injured. It’s nothing short of terrifying to be in your vehicle and realize that any main component of the car is breaking down. It’s even worse if you cannot alert other drivers around you about the situation so as to get off the road as soon as possible. According to the National Highway Traffic Safety Administration, the number of car accidents caused by true equipment failure is quite low; it only makes up around two percent of all vehicle crashes. However, since you’re out of control of the car during this time, these accidents can be deadly. You may only be able to control how you react and this is your best chance for avoiding a life-threatening accident. 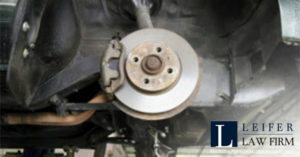 Of those two percent of all vehicle accidents made up by equipment failure, brake issues represent around 25 percent. While a brake failure or other equipment breakdown is rare, it’s still a situation you should take seriously. Keeping your cool in this situation could help you being severely injured or hurting others. One of the most important things you can do if you find yourself in this situation is to remove your foot from the gas. Adding any more pressure to accelerate could be problematic and make it harder for the car to slow down. You need to stay calm and try to get off the road as quickly as possible. If your hand is free, turn on your hazard lights so other drivers know what is going on. If you’re going to enter an intersection and you’re unable to stop the car, honk your horn constantly to alert other drivers that something is going wrong. This on its own may not completely prevent an accident, but it may help other people get out of the way. As you remove your foot from the pedal, use your emergency brake. Many people have never even engaged this brake, but it is almost always located in your center console. This may be your last ditch effort to bring the car to a complete stop, but it is one worth trying. If for some reason this method does not work, you can try to allow your car to slow down as much as you can before shifting the car into park. It is normal to panic in this situation, but you do not need to assume the worst. As you can see from what is outlined above, there are steps you can take in order to minimize your chances of being in a serious accident. At a bare minimum, do what you can to slow the vehicle down by taking your foot off the gas, using the parking brake and hazard lights, and putting the car in park if you have to. Sometimes, despite your best efforts you may still get into a car accident. This presents unique problems with regard to liability as well as injuries. If an accident happens, try to remain calm. Contact 911 immediately and let the police know there’s been an accident. You can prevent other cars from getting tangled up in the existing accident by using flares or hazard lights. Make sure anyone who needs medical attention gets it and move any debris out of the road as you wait for someone to come help. You may also need to consult with an experienced personal injury lawyer if you find yourself in this situation so that you can discuss how to move forward with an injury claim.